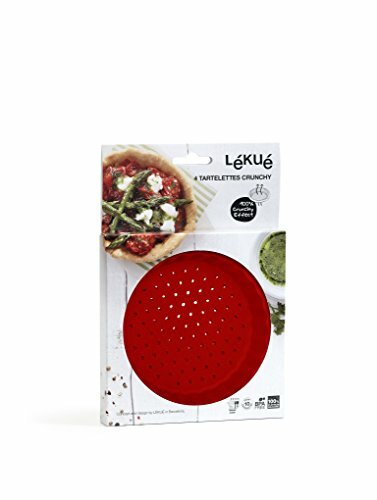 Lekue tart pan perforated set of 4 (red, 4.72") Allows you to bake home-made tarts with a crunchy finish. The secret is in the baking! due to the micro perforation the Lekue tart pans allow air to circulate through the holes to get a much crunchier crust. A home-made tart is a beautiful dessert and will reflect your creativity as the different possibilities are endless. Products manufactured with platinum silicone withstand high temperatures. Its versatility and ability to withstand to high temperatures make it safe to use in the microwave, oven, dishwasher, refrigerator and freezer.